One positive thing about having to travel for work is the opportunity to try and find the local jewels food-wise. Given I was going to be in Victoria for 3 full days in total, this leaves many meals for exploration. I’ll feature what I found in meal categories. After some on-line searching, magazine perusing and word-of-mouth, D and I got up one morning to trek out to the Broughton Street Cafe-Deli. In its own advertising it calls upon you to “Eat where the locals Eat”. I was being drawn in by the offer of smoked meat for breakfast. For $5.95 you can’t really go wrong. 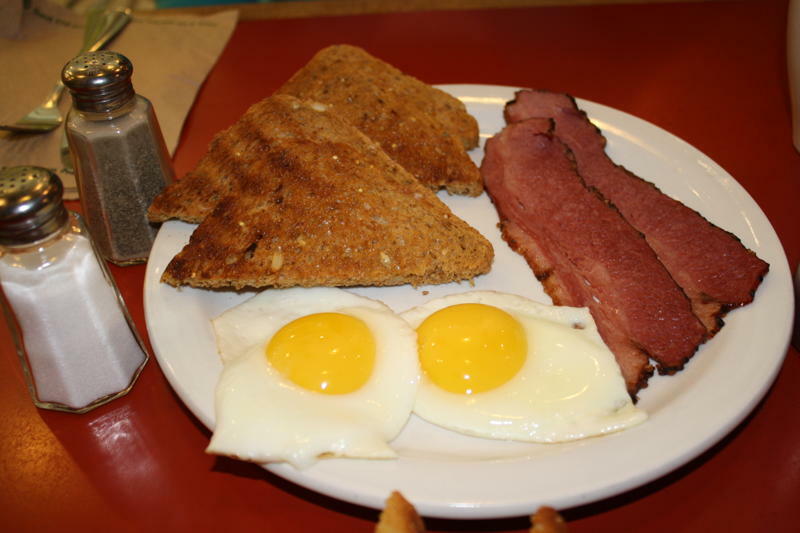 It was a straight forward two eggs, two slices of toast and two slices of the meat of your choice, including the smoked meat. I found it interesting that the owner offered me sriracha sauce, so I tried it with my eggs instead of my regular tabasco. It was okay but tabasco has more of a kick. I would like to go back and try the smoked meat sandwiches one day. What I enjoyed the most was the atmosphere of the place. We were surrounding by a nice balance of inspirational messages. There was a poster board about different things to do to build community and there were two large chalkboards that featured thoughts such as “Paralyse resistance with persistence. – Frank Tyger”. There was also a thought exchange pail near the counter, where you can leave a thought or take a thought if you cared to. Finally, the place had at least three clocks that I could see but had backgrounds that said, “who cares” or “whenever”, adding to the deli’s care-free feel. A second breakfast that I want to feature is the one we enjoyed at Jonathan’s restaurant, located at 425 Quebec Street. They don’t have their own website so I can’t link them to this posting. This was less of a trek as it was right behind our hotel. They had a $10 special which provided a substantial breakfast. The omelet took up half the plate, filled with bacon, ham, mushrooms and Swiss cheese on the outside. The sides were plenty of fresh fruit, including large slices of pineapple, honeydew, orange, kiwi and strawberry and butter-lathered toast. No skimping here. Unlimited coffee or tea too. Kelly was our server and a real gem. She was genuinely friendly and very talkative. She knew the quirks of the community, who was fighting with whom, etc. It made the experience quite memorable. While I was trying to stay away from the restaurants in the Hotel Grand Pacific because of past experiences and colleagues opinions on the food, when we had an in-house lunch meeting we had to order from the Pacific Restaurant. I had the turkey club which has “shaved brined turkey, whole grain mustard, broken avocado and crisp pancetta” according to its menu. As a side I had the Dragonfly Greens with a house made olive dressing. I would say that there is ample amount of turkey in this sandwich, difficult to fit into my mouth in one whole bite. I enjoyed the broken avocado but perhaps because of the heft of the sandwich it was a bit melted into the bread so it almost became guacamole in consistency. I’m also not sure where the pancetta was stacked in all of this but by the time I received it crisp is not the word I would use to describe it. I enjoyed the olive dressing, my first time to have it but would have appreciated more colour in my salad other than the dark greens and one cherry tomato. I couldn’t resist going back to Red Fish, Blue Fish for my departure lunch. I had gone last year with my friend H and the line-up was long. D and I had walked by it the day before just to ensure it was open, as poor weather conditions sometimes closes it down. This is a great restaurant on the pier below Wharf Street. D and I arrived at a good time (no line-up) and shared a one piece Halibut and Chips, a BBQ Fanny Bay Oyster Tacones, and a Chipotle Shrimp Tacones with slaw. The slaw and chips, for me, was nothing special. But that halibut was pinakamasarap! For avid readers, you know that if I’m using my Tagalog food-rating scale it’s a very good sign. 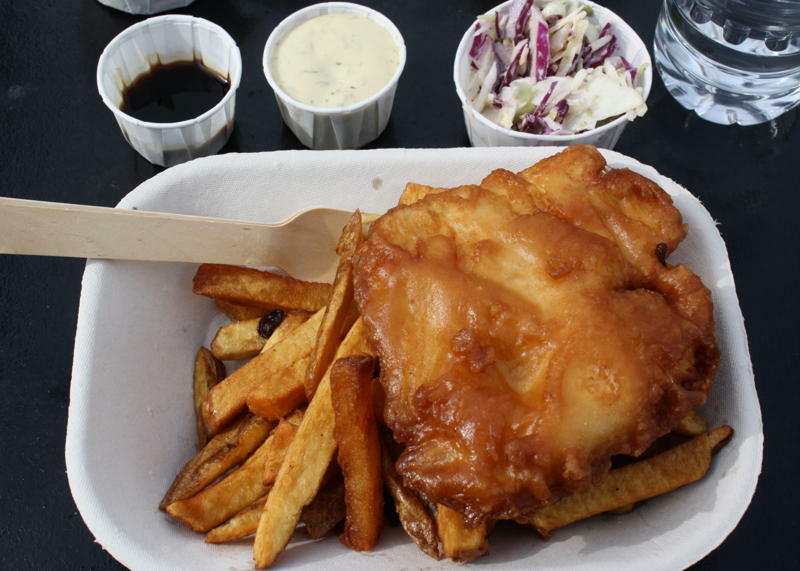 I am usually of the light and soft batter type when it comes to fish ‘n chips. Not today. This batter was golden brown, with a great crunch to it, but was not a sponge for the oil it was cooked in. And the fish – wow! The freshness, the taste, the substance of it… I was just grateful that D was willing to share it with me. It was so tasty on its own it felt almost criminal to dip it into anything, even if it was a great tartar sauce. I also enjoyed the BBQ Fanny Bay Oyster Tacones but not the Chipotle Shrimp one. The oyster tacones was juicy and full of differing flavours that kept my taste buds in the lunch. While the shrimp tacones had a lot of shrimp in it, it was one-note in taste and I found it a chore to finish it off. The dinner that I’ll feature is the one we thoroughly enjoyed at The Tapa Bar. Again, the previous year H and I went but had a mixed result being our first time. We had ordered too many items that had similar marinades or sauces. This time was D’s first time. I knew the atmosphere was going to be great, original art, body-swaying music and tapas to boot! We ordered a number of items but I really appreciated that the server brought them out in different pairs in terms of what they felt would compliment the other. We started off with the Mahi-Mahi ceviche (not Pacific Halibut as it says in their on-line menu) paired with Grilled chorizo. The Mahi-Mahi was served on a bed of romaine lettuce and had a fresh lime-tomato salsa beside it with a side of tortilla chips. It was a pretty substantial dish and one we ate right up! The grilled chorizo was as expected, but a nice charred flavour to accompany such a fresh starter. The next pairing was a Tostada and the Bistek al Ajillo. The Tostada is found under the vegetarian category and if it wasn’t for D’s suggestion I probably wouldn’t have even considered it. Wouldn’t you know it, it’s become my favourite thing on the menu! Despite the salsa verde, sauteed mushrooms and goat cheese on top, the tostada itself remained crisp. I loved the earthiness of the mushrooms and the fresh goat cheese being allowed to melt on its own on top of the mushrooms made this combination masmasarap! Now the beef steak was cooked to medium-rare as requested. It had more garlic on top that I found it needed, but I loved the minor touch of cutting the steak into bites sized pieces already done for us. Overall the sauce “outweighed” the meat and there weren’t enough side teasers (e.g. greens or breads) to help balance out the tastes. Although we had been enjoying the majority of the meal, it was tapas so the portions overall were small. I couldn’t resist ordering the Pollo Chipotle chicken wings (of course). They were 9 marinated wings finished off with white wine and chipotle peppers. For those who travel in wing circles these were wet wings, but I didn’t mind that. They didn’t have the heat I expected, but funnily enough came with a basket of its own breads, perhaps to sop up the sauce. At this point I was filling up so I only ate half the dish and took the rest home. The time delay actually worked in its favour because when I had them the next day there were a bit tastier and spicier. D finished off the meal with deep fried bananas and vanilla ice cream, I was so full that I had surrendered by this point. Overall, I obviously enjoyed my Victoria Vittles experience, and can’t wait for a return visit. Apparently one of the best Indian restaurants in the city is right around our Victoria Regional Office, so I’m gunning for that next time. Previous Car cakes are Cool!